It may seem like only yesterday, but it was 135 years ago today, April 22nd, 1876, that Wes Fisler of the Philadelphia Athletics (not related to the later Philadelphia A’s) was credited with scoring the first run in MLB history. Don’t ask me how they decided that this game between two teams who no longer exist in a league that was called the National Association counts as being the first game that really counts in the modern MLB history. I have no idea. 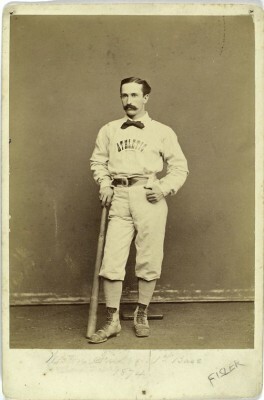 But they do start stats from this date, and because of that, Philly first baseman Wes Fisler has gone from being a forgettable utility player of the early 1870s and into the record books. He was the son of Camden’s Mayor, and the Philly first baseman stood a whopping 5’6″ and weighed 137 pounds. In other words, 10 inches shorter than Ryan Howard and 120 pounds lighter. With much sweeter facial hair. He died in Philadelphia on Christmas Day, 1922, and is buried at Laurel Hill Cemetery. He’s on facebook.